The water reservoir and filter holder of the coffee maker are two areas that constantly have warm, moist conditions. This means there is a high probability that mold will grow, making it important to know how to get rid of the mold. If it is not handled quickly, it will grow at a rapid pace. You also want to use a mild mold remover that uses no harsh chemicals, since you will be brewing beverages in this unit in the future. 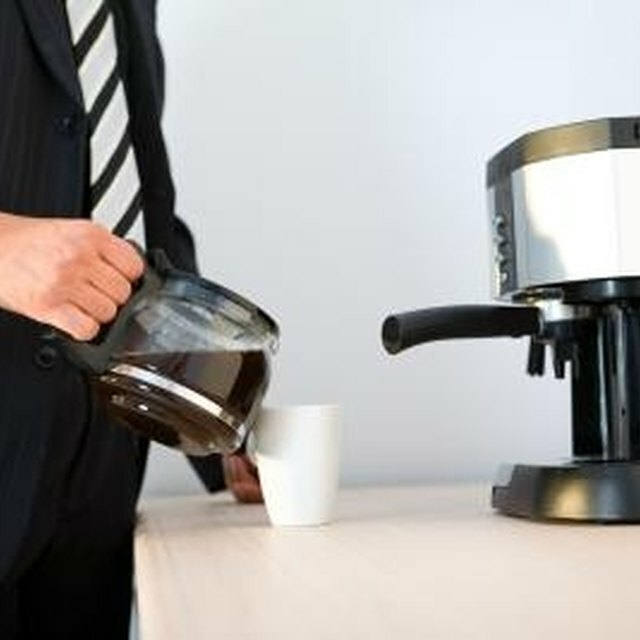 Clean a moldy coffee maker with vinegar. Pour equal parts water and vinegar into the water reservoir, filling the unit to the top. Turn on the coffee maker and let this water and vinegar mixture move through the system, just as it would to brew a pot of coffee. This vinegar and water will reach all moisture areas, breaking apart and killing mold growth. Discard the water, and repeat one more time. Examine the unit. If any more mold is present, scrub the mold off with an old toothbrush. Fill the reservoir once again with the equal mix of water and vinegar and flush through the unit. Fill the unit with plain hot water and run through the unit once more to get rid of any leftover vinegar residue.